In the days when rocks could talk and the Sun licked the Earth like a dog licks her puppies, it so happened that one of the Moon’s wives turned out to be a snake. When the two of them came to visit, the Sun did not open her arms to them and say, it’s an unconventional relationship between you two, but hey, whatever turns you on! Stars are not like that. She said, you’re not good for each other. You’re codependent, and Moon, there’s something wrong with you. Shield is a snake because you’re enabling her. You must renounce her, but while you’re at it, renounce the bad reputation you’ve sunk into, renounce all your bad habits. Deal with your shame, man! Why couldn’t she just say, come here, silly boy, you’re fine just the way you are? Why does the Sun need the Moon to make her human? but meanwhile the Moon is trapped in a story, as he always is. Night after night, he goes to a different woman, and they’re all like the Sun, needing him to make them human. He kisses them, listens to them, holds them tenderly. He tries to show them another way of looking at things, to turn their words into poetry, their movement into music, their flesh into paradise. It is all to no avail. They only want one thing from him, his potential. That is why his dreamy peregrinations are doomed to narrative. They want form. He builds expectations. To hell with it, he says to himself this time. This comfort I take with my wives, this impetus they manufacture in my life, I don’t need it! I am a philosopher, a musician, a poet. I love my wound! I will be a saint! The crone is the Moon’s love image divested of everything he craves. It is a profound sadness in him, dead possibility. She is romance unromanticised. She is now his eyes and all he sees. He never was separated from his mother. The Moon, for the moment, has renounced himself. Now it is just a story, and I may have got it wrong. You would think that the Moon would recognise sainthood as just another another addiction, wouldn’t you? How would you interpret the chart? Briefly put, a crone is a wise woman, but for very cogent reasons, one who has always been mistrusted. It is quite difficult to get to know her personally. She is not so much wise as steeped in wisdom, an unstinting servant to a community, but a stern judge, disconcertingly aloof, even arid, one feels. Her presence is impressive, but there seems something wrong with her face. How could it not reveal the embarrassment of suffering to the degree necessary to explain her knowledge? Her raucous good humour contemptuously despatches any suspicion of inauthenticity, and yet the edge to that humour leaves an impression. She reminds us of a man, proud in dependency, competent in redundancy, important in deference. She is the man in a woman, the mother of the Moon, an asteroid. 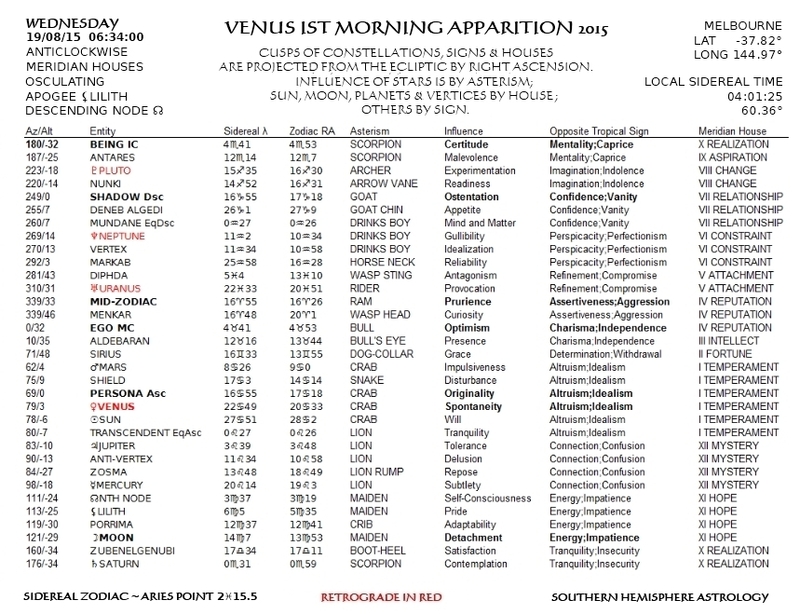 Retrograde Venus has passed the longitude of the Sun and will appear as the morning star, weather permitting, on Wednesday. Much dimmer Mars will not appear in morning twilight until October 24. Mercury and Saturn are visible in the evening, and Jupiter will appear in the morning twilight on September 30. The most commonplace things are in fact mysteries. Whether gloomy weather causes gloomy people or the reverse, is one. You must have noticed the connection: Australia plays a dismal Ashes series and southern Australia is plunged into three months of cloudy, rainy nights. What is causality anyway? Does a traffic jam cause me to be late, or do people being in a hurry to make up lost time cause traffic jams? Do we choose the people we are most likely to break up with, or do they choose us? You could say quite validly that the daily inching of the constellations over the eastern horizon causes the year and the seasons, while knowing full well the contingency of your perspective. We know the cause of the phases of the Moon, but they only exist from our perspective, so don’t we cause them really? Perhaps not only the tropical foundations of personality, but the seasons themselves, are of our own making. The morning twilight sky holds many secrets. Who arises habitually an hour before sunrise to see the first ring of light race around the horizon, and to witness a heliacal rising in the rosy glow of dawn? To my knowledge, only I. What joy I yearn to share when Melbourne strings together several successive clear mornings! 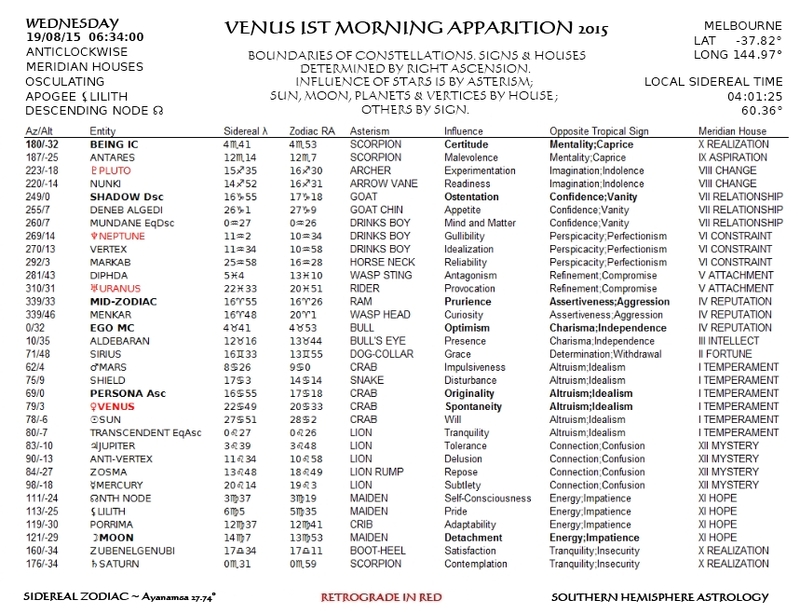 The Last Crescent Moon and half of planetary conjunctions are some of the morning’s delights, but I am on about something else today: a morning apparition of Venus. Venus enjoys an exalted position in astrology, but few people understand how that came to be. It is beautiful, certainly, and perhaps that is enough to associate it with goddesses, however, its influence on human minds and hearts began 5,000 years ago, when stargazers first realized the regularities of its appearances. Their first impulse was to worship it gratefully as the quintessence of harmony. In many cultures people did not see the morning and evening apparitions of Venus as of the same ‘star’, and it has two identities in astrology to this day: the ideal of creative perfection, and the ideal of competitive independence. The welding of those two identities into an integrated whole is the present custom, but I believe in keeping them separate. A long time ago it was noticed that an obvious pattern existed in the movements of these two entities which unified them but kept them unique, like two sides of an equation, and perhaps two aspects of dependently arising selflessness. 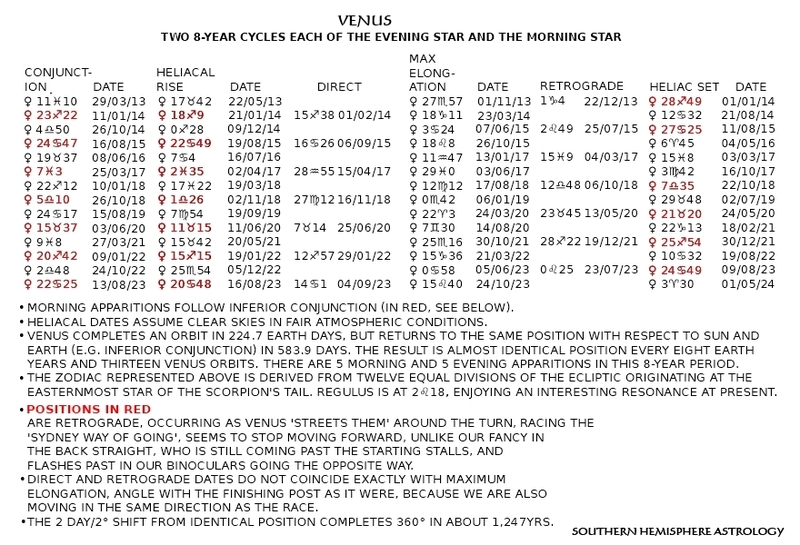 Not only does Venus return to the same spot at the same time every eight years, shy a couple of degrees, but its second four years mirror its first, alternately dusk and dawn. In other words, if they’re not identical twins, they must be one and the same, and how could they be, in a world without harmony and reliable design? Thank God I calibrated my software to conform with appearances before the heavens disappeared. The king said, look, it’s a lot easier to manage this rabble if we throw a festival from time to time. The thing is, it takes time to organise these things, so all I’m asking is, make it your job to know the signs, and when you’re absolutely certain they’re right, we’ll get the thing happening. Remember, there is a lot of people to move, feed and shelter. Get it right.Imagine how the first astrologer reacted. The world is full of signs, but they’re not signs of anything until you make them so. Leaves for example, fall off trees for many reasons. Only if nights seem much longer than days and a lot of birds seem to have disappeared, do leaves falling mean it will be cold for a while. So what is a useful frame of reference? An hour is the time between first light and sunrise, sunset and darkness. It is real, and to say, you’ve got an hour, is to say something meaningful. However, the king wants more lead time than that. The phases of the Moon are real too, but which ones announce the right month? I can see the astrologer sinking blissfully into a cosmic ocean of interconnectedness, except that his survival is at the king’s pleasure. While he is trying to collate signs such as wind direction, arrival of migratory birds, azimuth of sunrise, amount of rainfall and height of rivers, and intervals of the heliacal rise of familiar stars, he realises something very handy to know, namely that there are 365 days between one heliacal rise of a star and its next. He has discovered the half-fingerwidth per day revolution of heaven. The king wants next year’s festival a month later? Easy: last full Moon was among the stars of Goat’s Head Soup, the next will be in the Drinks Boy. A degree a day, twenty-nine a month, give or take half a day. We can ensure that the Spring festival is organised for Spring. Just in case the farmers are wrong and it does rain at a full moon, we can check which month we’re in against the stars rising in the morning. In case we can’t see those either, we can keep records on clay tablets of what we do see and do the maths. If heaven stands still or the Moon falls out of the sky, we’re all dead meat, but in the meantime, we can offer all people a calendar with which they too can learn to read the signs. Is that what you do with yours? 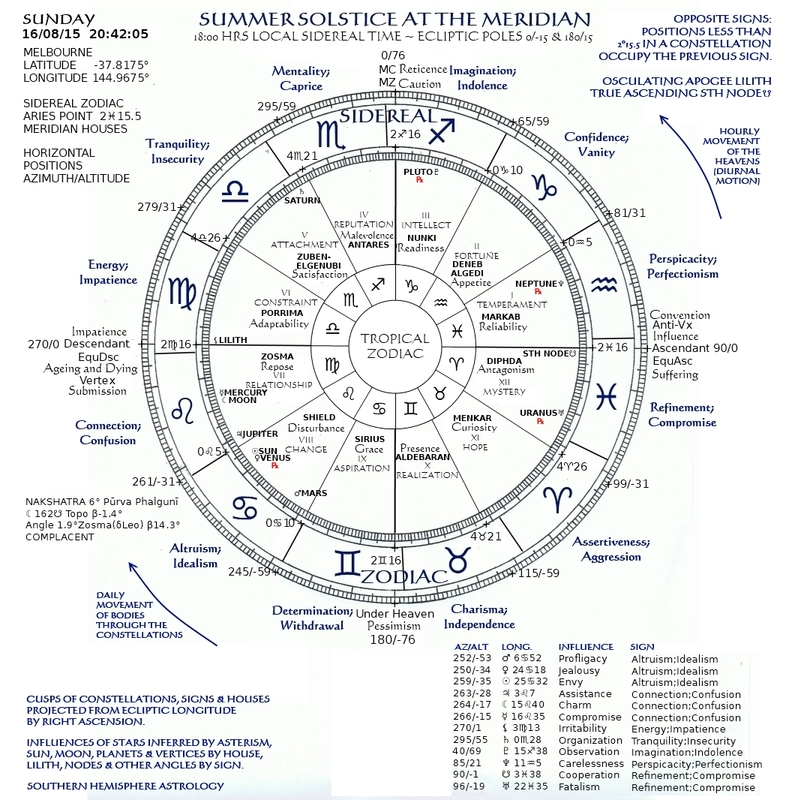 Southern Hemisphere Astrology is simply bent on finding meaning in what is in the sky. It pays homage to the signs, although it rotates them 180°, but recognises the background of fixed stars, and has been at pains to correlate them with the houses and constellations of the zodiac. It is probably inadvisable to ignore the adherence to the importance of aspects by traditionalists, but really, there is nothing sacrosanct about ecliptical squares, trines, oppositions etc.. It has come to seem obvious to me that sidereal astrology, if recognising kinship of Sun, Moon and planets with fixed stars, must abandon an ecliptical perspective in favour of an equatorial one. 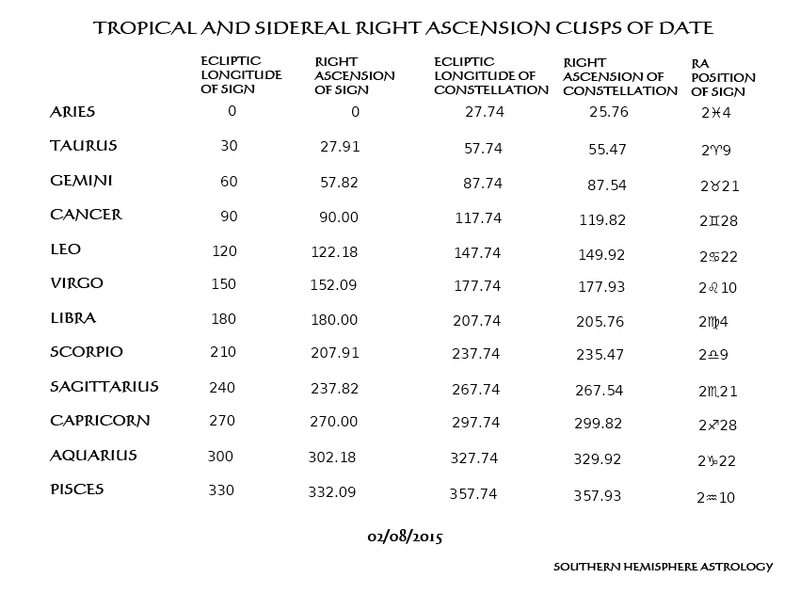 As you probably know, there are three main coordinate systems for locating objects in the sky for observation. 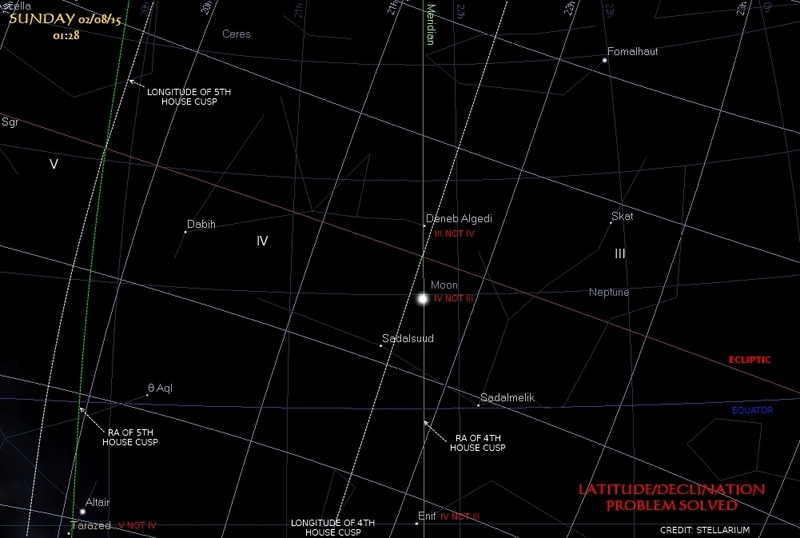 Astronomers generally use equatorial and horizontal coordinates, and astrologers generally use ecliptical coordinates. To run through them briefly, horizontal coordinates, which we are most familiar with, specify azimuth—angle (0-360) from due north measured clockwise—and altitude—angle (0-90) with the horizon. This is a simple system, but it cannot divide the sky informatively when several constellations are stacked on top of each other in the east, for example. Equatorial coordinates are a measure of an object’s position east of the Aries Point—our autumn equinox intersection of the planes of Earth’s rotation and orbit—along the celestial equator, and its angular distance from it, expressed as positive below or negative above, from our point of view. Ecliptical coordinates likewise measure an object’s angle with the autumn equinox, but along the ecliptic, and its angular distance from that. 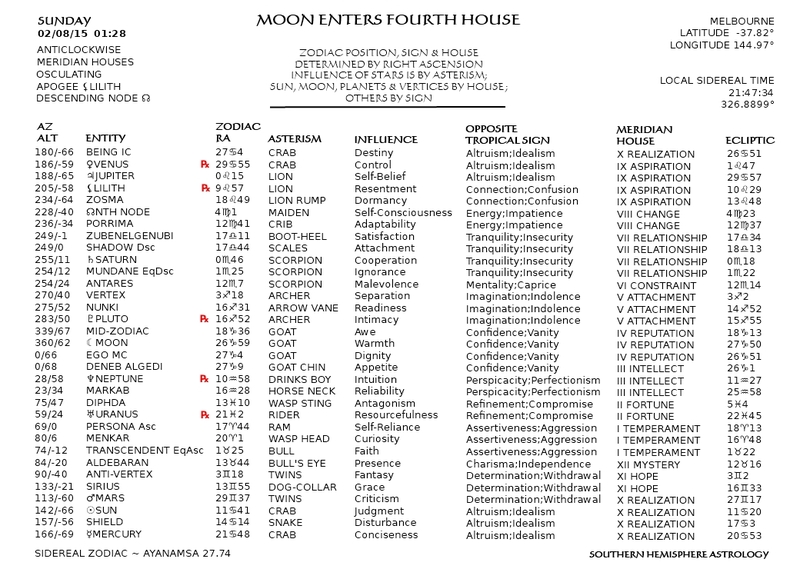 This system is preferred by astrologers who simply need to know the angles between objects and their progress through the signs, but its use in correlating positions of planets and stars in constellations and houses is limited, as illustrated by the problem highlighted in the image below. At the moment depicted, the Moon and Deneb Algedi straddle the meridian. The Moon has crossed, Deneb Algedi has not. The zodiac is slewed 21° west of north, and the longitude circle extending from the MC places the Moon in the third house and Deneb Algedi in the third. Can’t have it! Making the cusp of the fourth house (or the tenth in the upside-down convention) the intersection of ecliptic and meridian makes a lot of sense to me, but the exercise seems invalid unless the meridian is the fourth cusp for my sky and everything in it. 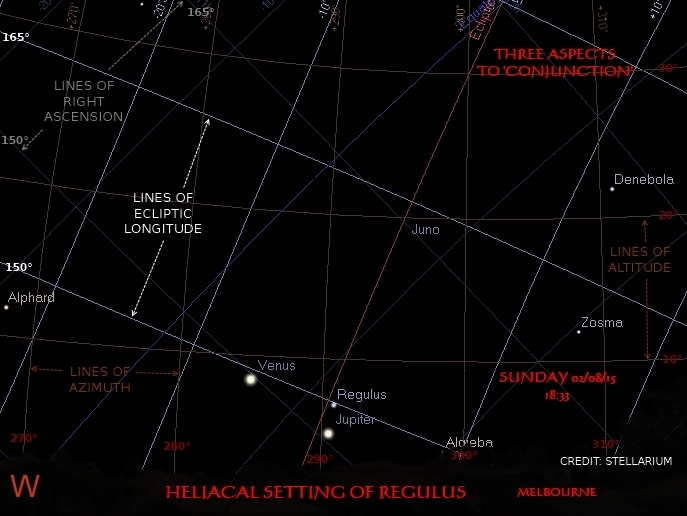 There is a way of retaining both the simplicity of the ecliptical system of location comparison and mid-heaven as cusp of the house of stature, which is to transfer the status of the meridian to the highest point of the zodiac arch, but thereby cast astrology adrift from an essential anchor, the hours of the day. Stickler for geographical exactitude I may be, but geometrical exactitude just does not work when projected onto the real sky in the real world. Therefore Southern Hemisphere Astrology now works in hour circles. Equal divisions of the equator form the cusps of houses, and the same equal divisions of the ecliptic form the equatorial boundaries of the constellations. 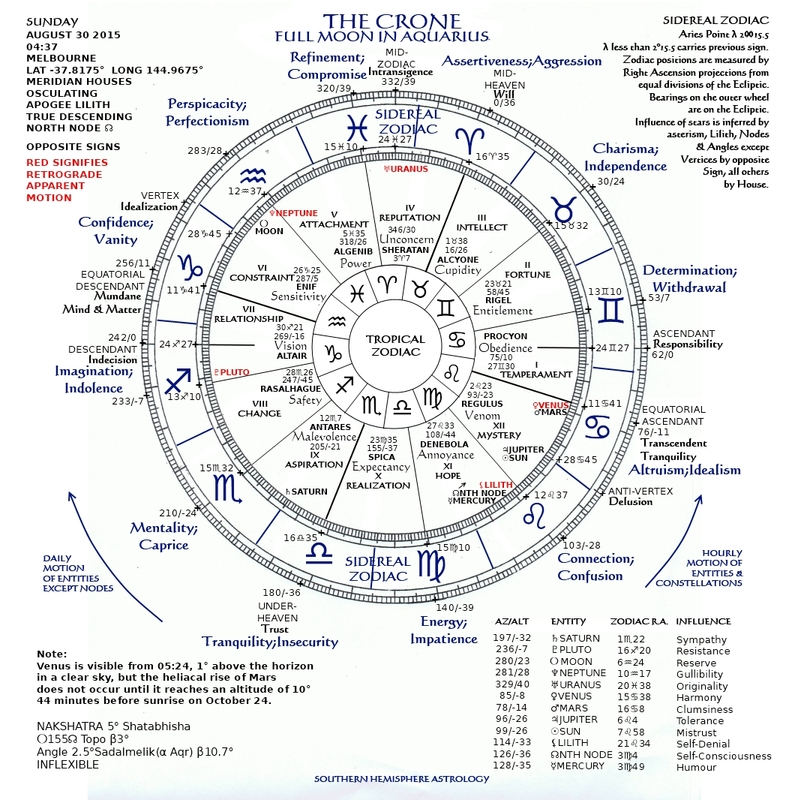 Zodiac constellations now vary slightly in size, as is shown graphically here. And a slightly different shape. Follow the circles of longitude to see their ecliptical shape. And you will see from the snapshot below of the Moon’s transit that mid-zodiac has now lost its symmetry with its ends, but the Moon is still in opposition to Venus and Jupiter, which are still in conjunction! Cardinals are still opposite each other, as are the vertices. More importantly, equatorial positions put the Moon west of the MC; ecliptical positions do not.